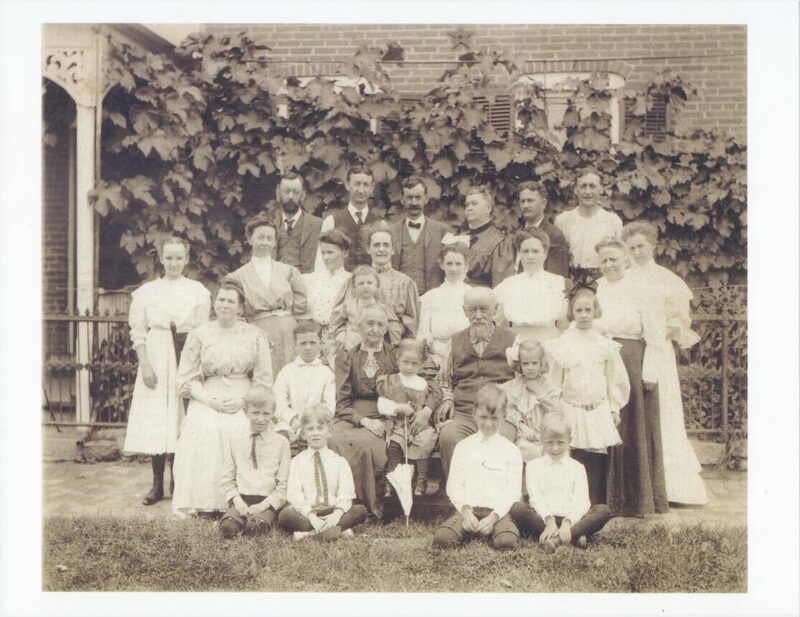 Recently, while tracking down the family of my great great grandmother, Maria Hein (Mrs. William Solle), I looked into her sister, Mrs. Anna Helfer. On 9 Sep 1887, a Philip Halfer committed suicide in Springfield. The next day, both the Illinois State Journal and the Illinois State Register ran lengthy news reports on his death. I’ll write another post later about the circumstances of the suicide. However, there were two pieces of information in the Journal’s report that compel me to write before I’ve completed much additional work. The Journal’s report does not give Mrs. Halfer’s name. She is merely referred to as Mrs. Halfer. But it does say she is a sister of Mr. Charles Warner of East Springfield. Emilia Kibele’s obituary lists her siblings, including Mrs. William Solle, Mr. Charles Werner, and Mrs. Anna Helfer. It appears that suicidal Philip Halfer is the husband of my 3rd great aunt, Anna Hein. I love it when I can piece things together and make a connection. While contemplating suicide the day before his death he told Mr. John T Rhodes that his real name was Hartman and not Halfer. In my Voigt family tree, I have a second cousin twice removed named Charles William Teasdale. He was born in 1896 in Cassville, Wisconsin, the town my great great grandfather Anton Weiss lived in, and grew up there until the early 1910s. In 1913 his mother Clara Voigt died, and in 1914 his father Alonzo B. Teasdale died. Charles and his brother Harold made their way to the Chicago area, where Charles married Mae Alice Vonasek in 1920, whose father had also died while she was young. 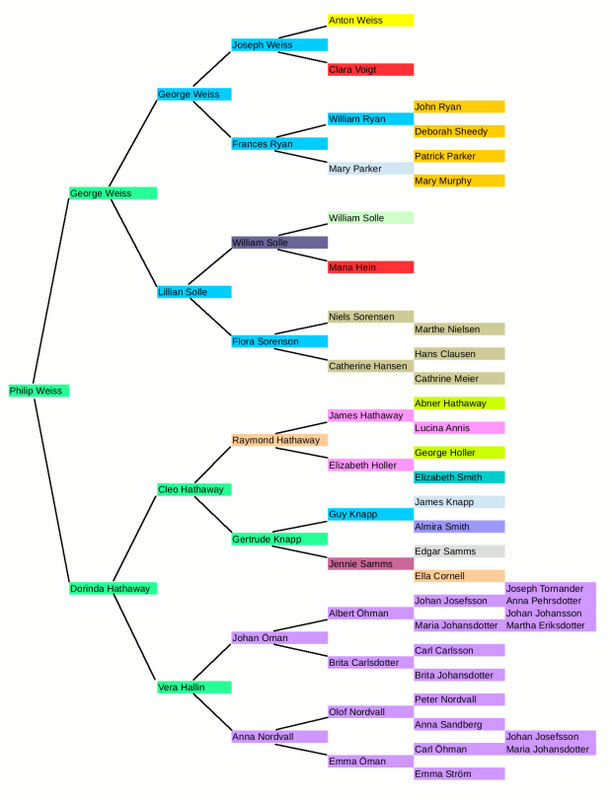 Charles became involved in an evangelical church as well, and this is where the genealogy gets interesting. In 1924, Charles and Mae went to Kijabe in the British Kenya Colony and became missionaries. The key records for many of my relatives are census records. Not so with the Teasdales. Their missionary work kept them out of the U.S. during the 1930 and 1940 U.S. Censuses. 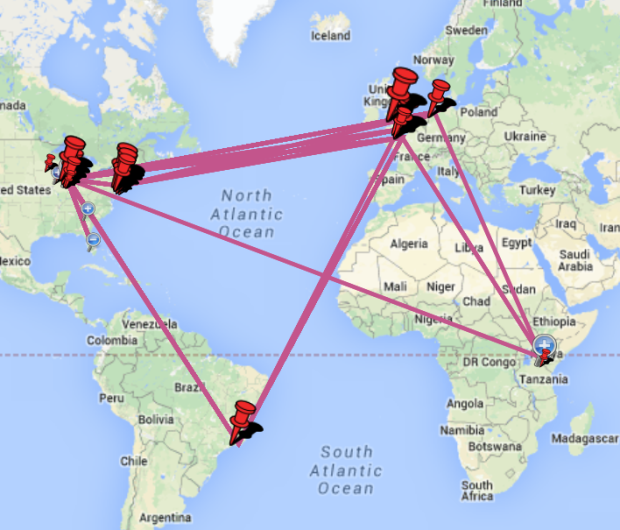 However, they left a long trail of migration records with frequent exits from the U.S., transit through the United Kingdom, returns to the U.S., and even one stop in Brazil. In 1924, the first left Oak Park, Illinois for Kenya, traveling via New York and Southampton, England. They returned in 1931 with one child, traveling through Bremen, Germany and re-entering the U.S. at New York. In 1933, they again left Oak Park for Kenya. 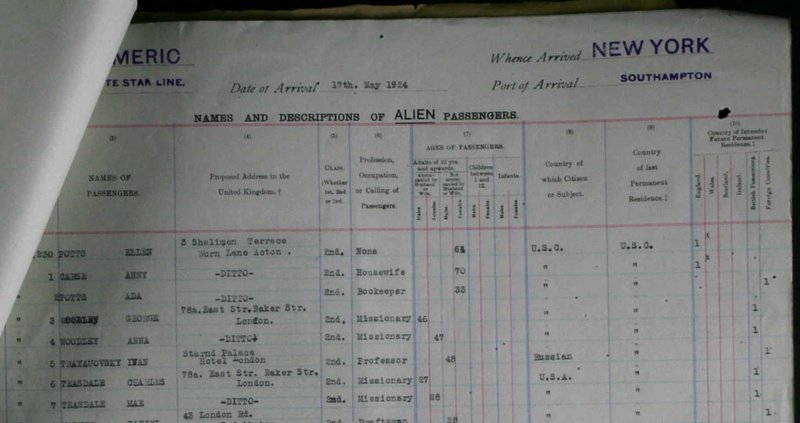 They also traveled through Southampton, England on their way to British East Africa. The family returned in 1938 via Le Havre, France, this time with two additional children. They only stayed until 1940, when they again went to Kenya. This time they traveled via Rio de Janero, I assume in part because World War II made travel through Europe too dangerous. The Brazilian records for their 6 day stay in Rio included the passport photos used at the top of this post. In 1947, they came back to the U.S. again. 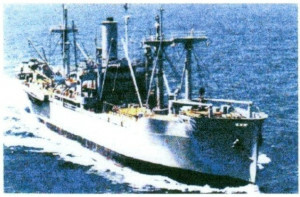 This time they embarked in Mombasa, British East Africa and sailed directly to New York City on the Great Falls Victory cargo ship. The pair left again in 1949, this time traveling back to Kijabe through Southampton, England back. They returned in 1955, flyinf Pan American Airlines from London. And in 1957 they left the U.S. for Kenya for at least the 5th time. U.S. and U.K. passenger manifests after about 1960 are not public, so I don’t know how many more times they passed through our borders. Nowadays international travel is much more common, but back then it was rare. This currently the largest amount of travel records I’ve got for one couple in my family tree. Mae Vonasek Teasdale died in Kijabe in 1970 and is buried in the cemetery nearby. Charles remarried in 1972 before retiring to a retired missionaries community in Florida where he died in 1985. I haven’t read up on the Africa Inland Mission in Kijabe, so I don’t know how integral the Teasdale’s were to their work, but they obviously spent a lot of time there. At least two of Charles children became missionaries, and there are several more generations after them. As some of them are alive, I’ve not written any identifying information about them. When I first started recording sources, I didn’t understand the citation/source/repository model that is the basis for a lot of genealogy programs. I struggled to record a marker as the source for dates of birth and death. I sometimes recorded the marker itself as an individual source, but that quickly results in many entries in the source list. I also tried using myself as the source, when I personally canvassed the cemetery and recorded the grave markers. But logically, that’s incorrect because I am not the entity with the knowledge. I am a secondary source, and the original is available. element in a Source List Entry. That paragraph was a revelation to me. Now I have a series of sources such as “Washington, Seattle, Calvary Cemetery grave markers” in my Gramps database. This works great. For each citation linked to the source, it’s clear that the source(s) are the grave markers themselves. As a practical matter, I’ll rarely know who the informant was for the grave markers, so this is going to be as far as I can go in the chain. However, when Ms. Shown Mills gets to online databases of burials, her recommendation changes. In that case, she recommends using the creator and web site as the source list entry. I don’t think that always works so well for my database, and I’m experimenting with switching my database to her recommendation in the paragraph above. When an online source has photographs of the grave markers, I’m still using the grave markers as my source, not the web site. In fact, what the web site says could be completely wrong while the photo included is correct. On Find a Grave, it’s common for people to add additional information not found on the marker. It’s common for memorial managers to change the listed information when they think they have better source. Older grave markers often have incorrect dates of birth, and memorial managers sometimes put the correct date rather than the date on the marker. I think I want to have separate citations for the information in the memorial and the information drawn from the markers. For the information on the markers themselves, what I am trying now are citations to the cemeteries, attaching the images of markers to those citations, and sourcing each image to the Find a Grave memorial (or whatever web site/database it came from). Basically, creating a chain of citations. Anyone using my database can trace the information to the web site; that is not lost. This is for recording in my database, not for publication. For a published article, I would cite as Evidence Explained recommends. If someone wanted me to write an article for them. Which no one does, at least not yet. I use Gramps as my genealogy database. In Gramps, citations are first class objects, meaning they can be used multiple times in support of multiple facts. In GEDCOM and many other genealogy database programs, one citation supports a single fact. To support another fact, a second citation with exactly the same information is created. My model above may not fit the data models provided by programs other than Gramps. This makes me wish Gramps and other programs had support for chains of citations. The only reason this works at all in Gramps is that media can have source citations. If I don’t have separate media, I cannot cleanly model this in Gramps. I checked Tony Proctor’s experimental STEMMA genealogy model to see if he thought of this. Unsurprisingly, STEMMA provides for chains of citations. I hope Mr. Proctor can get some of this into FHISO standards and those are actually adopted by software vendors. I’m still mulling over some thoughts on using Find A Grave and the photos there as sources for the burial location itself. Expect another post on that… sometime. I need to try some things out. 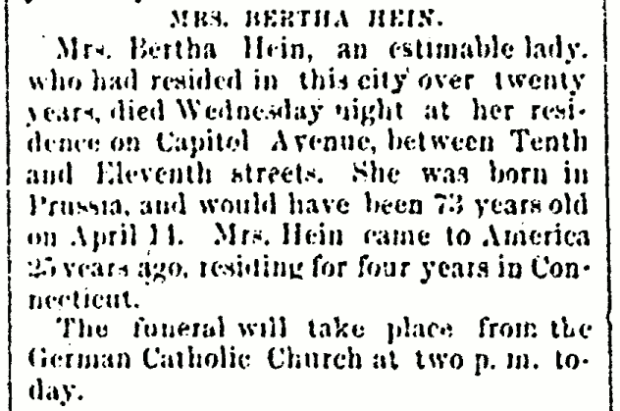 Mrs. Bertha Hein, an estimable lady, who had resided in this city over twenty years died Wednesday night at her residence on Capitol Avenue between Tenth and Eleventh streets. She was born in Prussia and would have been 73 years old on April 14. Mrs. Hein came to America 25 years ago, residing for four years in Connecticut. The funeral will take place from the German Catholic Church at two p.m. today. This is intriguing because I am looking for the parents of my 2nd great grandmother, Maria Hein Solle. I’ve previously found a number of siblings, but I hadn’t found any information on their parents. I believe it is likely that Bertha Hein is my 3rd great grandmother. William Solle and his wife Maria Hein lived at 1017 Capitol Ave. In an obituary for their daughter Carrie that appeared on 13 Dec 1880, their home is described as being on Capital Avenue between 10th and 11th streets, exactly the same wording as that used 9 months earlier for Bertha Hein. A woman with the same surname as Maria living at the same home in the same year is extremely likely to be a relative. 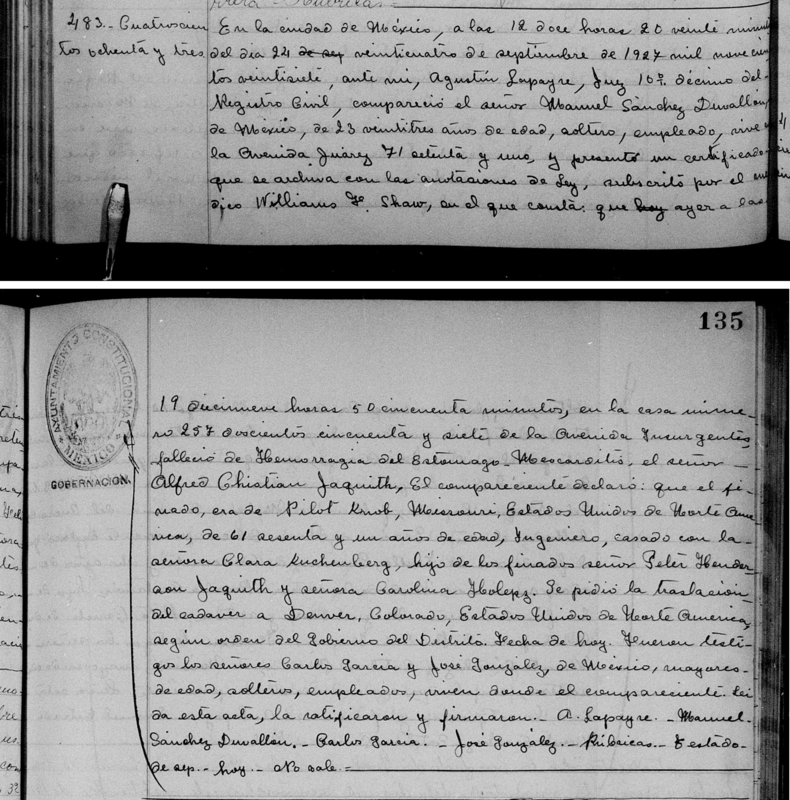 Because Bertha’s date of birth is in 1807 and Maria’s is in 1843, Bertha is from Maria’s parents’ generation rather than her grandparents or her own. Bertha could be an aunt by blood or marriage, or a cousin of some sort of her parents, but the obvious relationship to start with is mother. 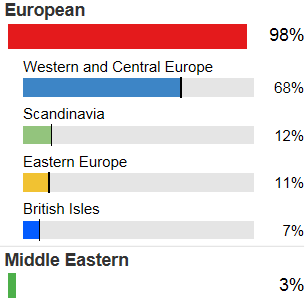 Given the increase in testing for ethnicity alone, I’m seeing a huge increase in people who are both confused by and disappointed in their results. And of course, there are a few who are thrilled, trading their lederhosen for a kilt because of their new discovery. To put it gently, they might be a little premature in their celebration. Last night I watched the retirement of Washington product Daniel Bryan on WWE’s Raw. At the same time, I was researching Ernst Sundberg, the son of Nils Johan Sundberg, subject of my previous post. He emigrated from Sweden to Canada. Because he lived most of his life in Canada, I don’t have as many resources I can use to research him. The easy sources are the Canadian censuses, where Ernest Sundberg appeared in the 1911, 1916, and 1921 Canadian censuses, and his details matched up with what I knew about Ernst Sundberg. I also have a couple of Manitoba newspapers I can view at newpapers.com and newspaperarchive.com. I found nothing about an Ernest Sundberg. However, there were a couple of references to Ernie Sundberg, featherweight wrestling champion. Going on gut, I searched online for him using Google. What appeared near the top of the results was a history theses by Charles Hatton, “Grappling on the Grain Belt: Wrestling in Manitoba to 1931”. It’s the story of early catch-as-catch-can wrestling in Winnipeg, featuring numerous bouts starring Ernie Sundberg, the hero of the local Swedish community. Mr. Hatton’s thesis gives Ernie Sundberg’s date of birth as 2 Mar 1884 in Luleo, Sweden. And what do you know that matches up exactly with Ernst Sundberg’s entry in the Luleå birth register. We have a match! 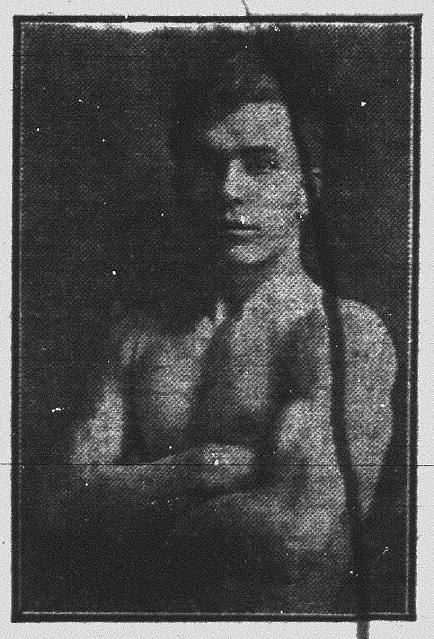 At the end of the thesis, Mr. Hatton has images of many of the wrestlers mentioned. Two of them are of Ernie Sundberg. So not only do I now have a relative who was involved in wrestling, a form of spectacle I find very entertaining, I have photos of him!